Each 10 ml multidose vial contains 100mg per ml and comes with a green coloured flip-off top. Primobol-100 (Methenolone Enanthate) is a well-known and popular steroid as well. Like nandrolone it's most often used as a base compound for stacking with other steroids. Methenolone however, is a DHT-based steroid (actually, DHB or dihydroboldenone, the 5-alpha reduced of the milder boldenon). Meaning when it interacts with the aromatase enzyme it does not form estrogens at all. That makes it ideal for use when cutting when excess estrogen is best avoided because of its retentive effects on water and fat. Methenolone is mostly only used in such instances, or by people who are very succeptible to estrogenic side-effects, because the anabolic activity of methenolone is slightly lower than that of nandrolone, quite likely BECAUSE it is non-estrogenic. Primobol-100 (Methenolone Enanthate) is a registered trademark of Schering A/G avaiable in 50 mg/cc from Mexico and 100 mg/cc from Europe. It is is the "Cleanest and Gentles" anabolic steroid, will not aromatize, non-toxic, low in androgens. Primobol-100 (Methenolone Enanthate) may be taken by both Men and Women. Dosages for men are 100-300 mg/week, Women 1/2 dosage. Primobol-100 (Methenolone Enanthate) is the only steroid that works well on a low calorie diet. Effective for bulking, but tends to harden and add muscle tone more that build big muscles. Primobol-100 (Methenolone Enanthate) works great when added to a cycle (stacked) with other steroids, it tends to lessen water retention and harshness when stacked with more heavy duty testosterone injectables, like Omnadren / Sustanon, Cypoinate / Propionate, ect. It is an analog immune-stimulating steroid used by people with Aids and others with depressed immune systems to build up the immune system and add lean muscle mass. 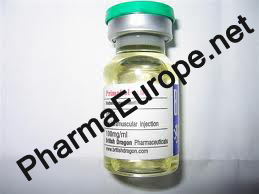 Primobolan is one of the finest steroids in the world today. by Bill Roberts - Primobol-100 (Methenolone Enanthate) is a Class I steroid working well at the androgen receptor but which apparently is ineffective in non-AR-mediated anabolic effects. It is most closely compared to Deca Durabolin , requiring a little higher dosage to achieve the same anabolic effect, but since it is pleasant to use at doses considerably higher than what is pleasant for nandrolone esters, it can achieve higher maximal effectiveness. That is, provided that one can afford it a gram per week of Primobol-100 (Methenolone Enanthate) can be costly. 400 mg/week should be considered a reasonable minimum dose.